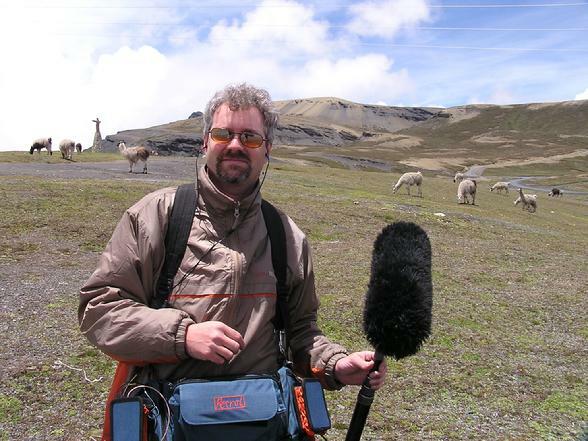 I have worked as a sound recordist for over 20 years. My work has taken me all over the globe covering everything from War Games to Grape Harvests. Recording the sounds of a Stradivarius cello and the roar of the Space Shuttle have been but two of the many highlights of my career. Interviews with fascinating personalities like B B King, Stan Lee and President Obama remind me that this is not just a job...it's an adventure. "A Dangerous Business", "Hunting the Nightmare Bacteria"
One World - "Thailand", "The Baltics"
Modern Marvels - "Surviving Alaska"
Worlds Toughest Fixes - "Solar Power Plant", "Giant Wind Turbine"
Extreme Engineering - "Panama Canal"
Explorer - "The Angel Effect", "24 Hours After Hiroshima", "Collapse", "Mysteries of Survival"
Understanding - "Electricity", "Odds", "Fire", Extra Terrestrial", "Sleep"
Great Books - "All Quiet on the Western Front", Madame Bovary", Galileo"
Full line of cables, adapters and headphones.